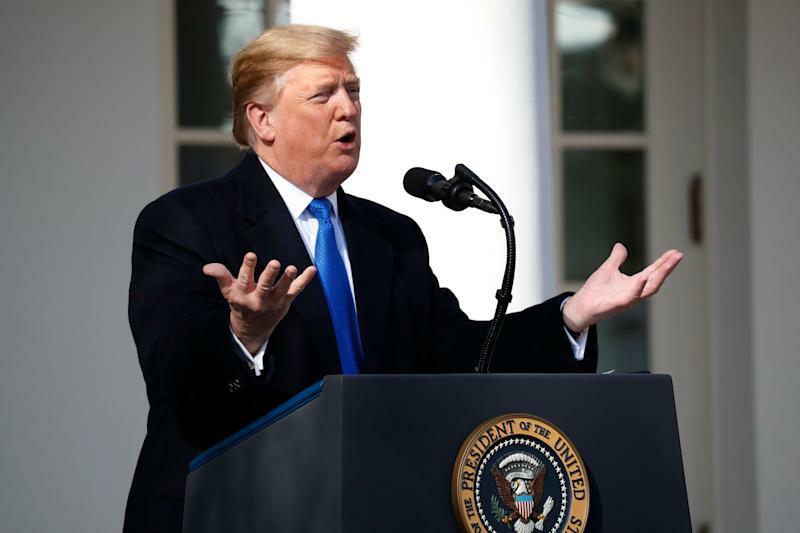 In a rambling, teleprompter-free diatribe, President Trump announced that he was declaring a national emergency in order to build a wall at the southern border. In doing so, he brought up many of the discredited arguments he has been relying on over the last several months. He said drugs coming across the southern border don’t come through official ports of entry (not true), that El Paso, Texas, was dangerous before the construction of a wall (not true) and that women are being trafficked across the unguarded portions of the border (no evidence exists of this). Trump also disputed studies that have found undocumented immigrants commit crimes at a lower rate than native-born citizens. An emergency declaration would allow Trump to divert funds appropriated for other purposes to build the wall. Trump has said he would shift the money from “far less important” government programs, including the Department of Defense. A Pentagon official told the New York Times that one likely scenario would be to divert up to $2.5 billion in counternarcotics funds to the Army Corps of Engineers. A deadlock with Congress over border security issues led to the 35-day partial government shutdown that ended last month. Congress passed a continuing resolution Thursday to fund the government and avert a second shutdown, and Trump has agreed to sign it, but he made no mention of it in his remarks. House Speaker Nancy Pelosi has the option of triggering a vote on Trump’s declaration, forcing Republicans to go on the record about whether they support the emergency wall. Two Democratic representatives, Joaquin Castro of Texas and Alexandria Ocasio-Cortez of New York, have already announced plans to introduce a resolution that would terminate the emergency declaration. But even if the declaration survives congressional challenges over appropriations, actually building the wall could face legal challenges from landowners along the border whose property would need to be acquired. Trump acknowledged that this act would likely face a legal challenge that could reach the Supreme Court. On Thursday, Pelosi warned that a future Democratic president could use the precedent of declaring a national emergency for other purposes, such as gun control, citing the anniversary of the Parkland, Fla., mass shooting that left 17 dead. "Because if the president can declare an emergency on something that he’s created as an emergency, an illusion he wants to convey, just think what a president with different values could present to the American people,” said Pelosi. “You want to talk about a national emergency? Let's talk about today. The one-year anniversary of another manifestation of the epidemic of gun violence in America. That's a national emergency. Why don't you declare that emergency, Mr. President? I wish you would. But a Democratic president can do that. A Democratic president can declare emergencies as well." Trump’s declaration of a national emergency came hours before he was scheduled to depart the White House for his Mar-a-Lago estate in Palm Beach, Fla., for the weekend.